There are a number of reasons that students choose to study abroad, whether that be over the summer, for a semester, year or even the full duration of a degree. From wanting to improve your language skills in a new country to experience a different climate and culture, there are lots of great reasons to consider studying abroad as part of your degree, if not for the whole course. The top European countries for US students studying abroad are UK (12.2%), Italy (10.8%), Spain (9%), France (5.8%), Germany (3.5%) and Ireland (3.3%). The UK has always been a popular study abroad destination, usually only coming second to the USA in terms of intake of students from China and India, which together make up just below 48% of the total inbound study abroad students in the USA. There has also been a strong relationship between the UK and the USA sending their students to each other’s country to study – just over 11,500 UK students travelling across the Atlantic to study in the USA and more than 38,000 American students studying in the UK for the 2014-15 academic year. 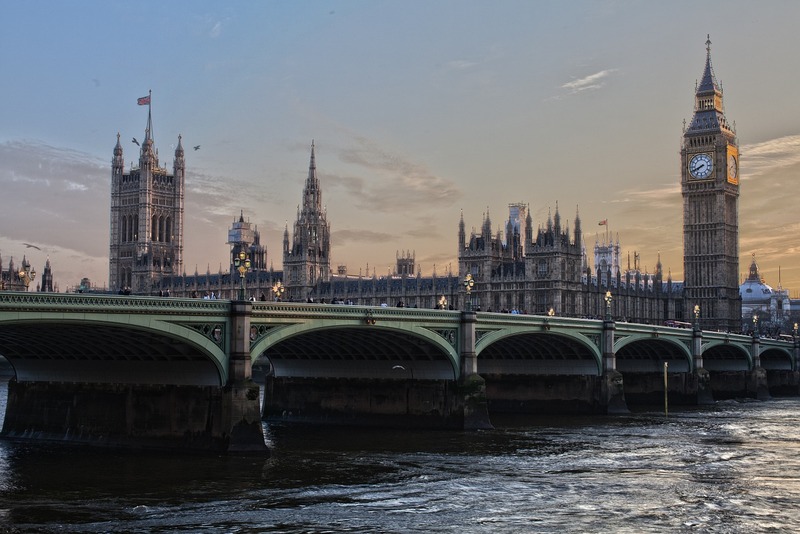 Although there was a very slight decrease in the total number of students studying abroad in the UK last year, this reduction did not knock the UK from the top spot as a study abroad destination for US students. There are a number of initiatives that support transatlantic study including Across The Pond and The Fullbright Commission, which offers scholarships to support students wishing to study abroad. These scholarships are very competitive, so you should plan in advance if you intend on applying for one. The deadline for the 2017 academic year has passed. The application process for the 2018/2019 academic year will start in August 2017. Many Americans choose the UK as a study abroad destination because English is the primary spoken language and the culture is quite similar. That said, there are a number of notable differences. Read Chloe’s guide to fitting in when studying abroad in the UK. University College London (UCL) was reported to have the largest number of international students in the 2014-15 intake, with 20,745 EU and non-EU international students recorded. Italy has a rather asymmetrical relationship with the USA when it comes to studying abroad. 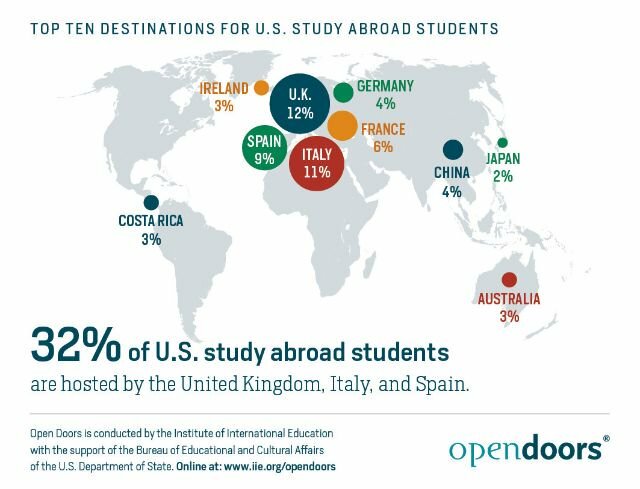 Open Doors 2016 reported that Italy was the second most popular destination for US students, with the USA sending over 33,500 students to study abroad in Italy for the 2014-2015 academic year. In return, there were only around 4,900 Italian students studying abroad in the US during this year, with the majority of Italy’s study abroad students opting to go a bit closer to home in the neighbouring and surrounding European countries such as the UK, Austria, Spain, France, Switzerland and Germany. There are many reasons that students from the US and around the world choose to study abroad in Italy. The country is very diverse, ranging from thriving cultural cities such as Rome, Milan (one of the world-leaders for fashion), Venice, Naples and Florence to more remote towns located off the beaten track and surrounded by the natural beauty of vineyards, mountains and stunning coastlines. Italy has 89 universities, as well as a number of polytechnics and academies, offering plenty of opportunities for study abroad students. Accommodation and living costs in Italy are relatively high compared to many countries in Central Europe but are still much cheaper than most places in the UK. Universities are free to set their own tuition fees, but they generally charge similar fees for EU and non-EU students, which start at around €1000-1500 ($1060 – $1600) per academic year. 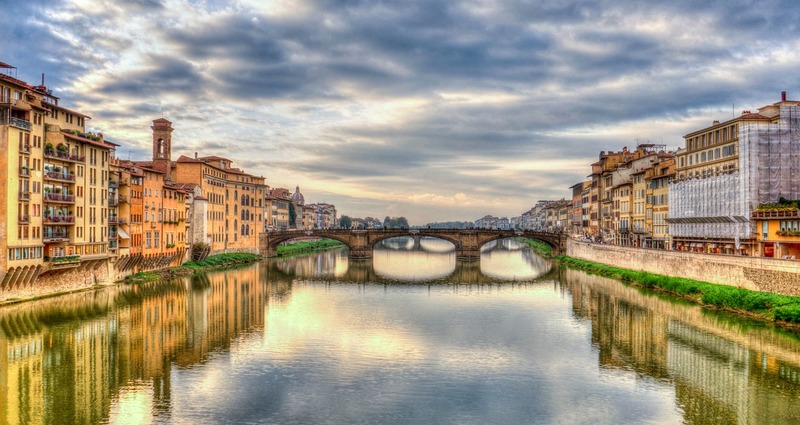 If you’re wanting to get a taste of European culture and love a good pizza, then Italy might just be the ideal study abroad location for you. 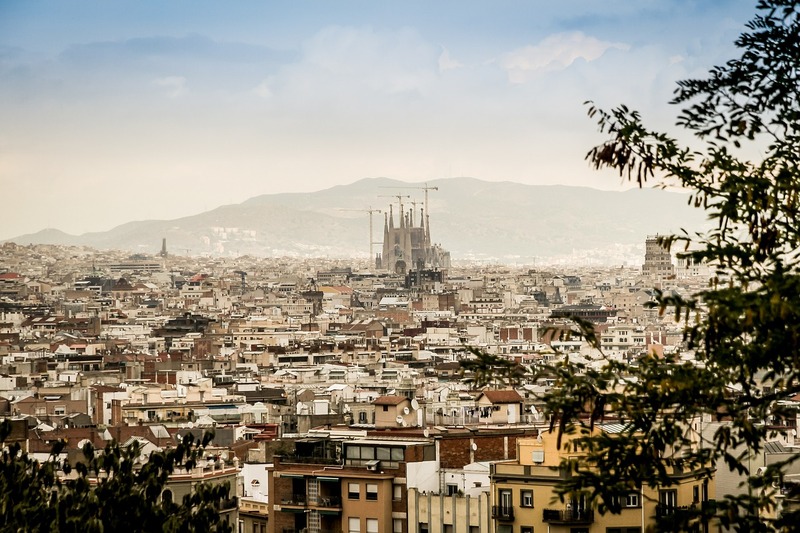 Located in the South-West of Europe, Spain is the third most popular study abroad destination for US students, with over 28,000 students flocking there for the 2014-15 academic year. The country has 74 universities to choose from, with many institutes located in the populous cities of Madrid, Barcelona, Seville (famous for its oranges) & Valencia. The country’s highest-ranking university is the University of Barcelona, which is ranked joint 160th in the world in the QS World University Rankings 2016-17. The most popular course in Spain is Law, followed by Arts & Humanities, Marketing & Finance, Science degrees, Spanish courses and Hospitality Management. Known around the world for paella (a traditional Valencian rice dish with mixed seafood, meats or vegetables) and siestas (a nap which typically taken in the early afternoon, during which many shops shut), there is much more to Spain than food and sleeping. If you like good food and wine then you will not be disappointed with a study abroad experience in Spain – as, with much of Europe, the legal age to drink alcohol is 18. The cost of tuition in Spain is very cheap compared to the UK and USA, with tuition fees at public institutions typically between €700 and €1300 (approx $750 – $1400) per year. 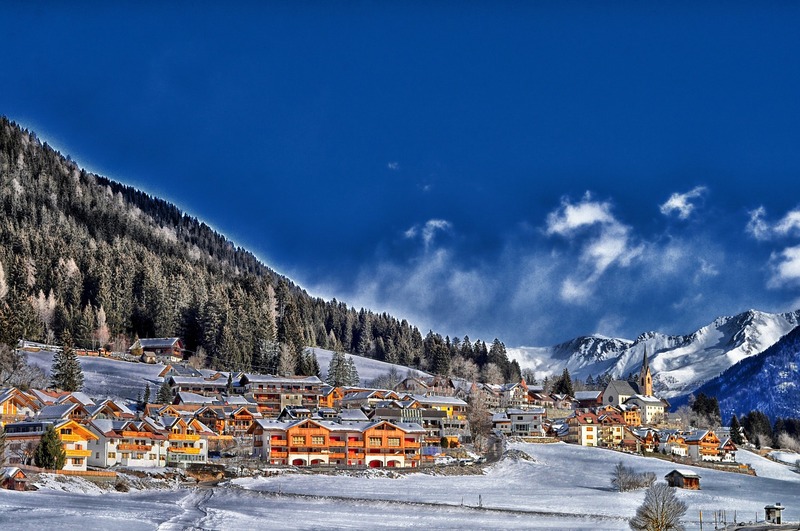 As with Italy, living in the main cities comes at a cost, but more affordable ‘country living’ is also possible, which will also help you keep away from expensive tourist hotspots. 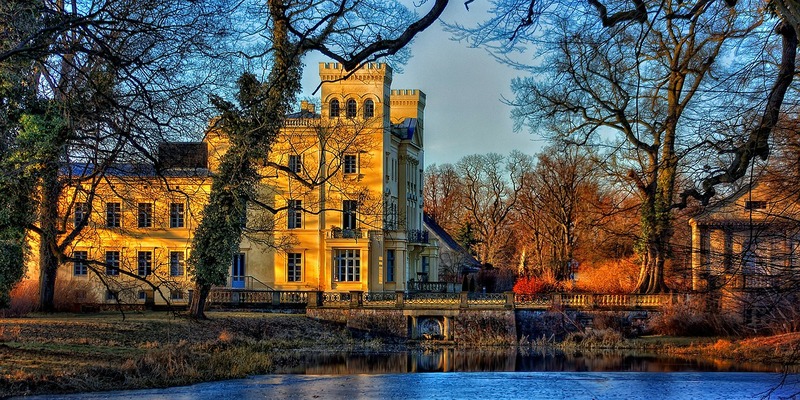 If you’re looking to explore Europe on the weekends, there are many cheap flights from Spain from under $30 return to all across the continent, including the UK, the Netherlands, France & Germany. So if you come to study abroad in Spain you can enjoy the sun, soak up the culture and use it as a gateway to see Europe on a budget. Home to the croissant, the Eiffel Tower and Paris, the city of love, France is the fourth most popular study abroad destination for US students, with over 18,000 students making the journey to study abroad in France for the 2014-15 academic year. In contrast, France sent just under half this number to study in the USA, with around 8,750 student inbound French students in 2014-15 and 2015-16. In total, there are around 250,000 international students studying in France each year, so you certainly won’t be alone if you choose to study abroad in France. There are 83 public universities in France, all of which are funded by the national government, meaning that they offer very affordable education to students from France and overseas. As the primary spoken language in France is unsurprisingly French (although they do speak a number of other languages) you should have a good level of conversational French if you intend to study there for more than a few weeks. There are intensive language courses that you can take there if you are worried that you do not have the language ability required to study in France. With 10 French universities included in the QS World University Rankings 2016-17, the low tuition prices clearly do not indicate a dip in quality of teaching – tuition fees of around $1,000 per year for both international and domestic students make France amongst the cheapest university tuition fees in the world. The advantage of cheaper tuition fees is that you will have more money to spend on your time abroad – and there is plenty that you will want to spend your money on when you’re living in France. If you don’t fancy braving the 45 million tourists visiting Paris each year, why not consider studying in the picturesque medieval city of Lyon, which was awarded UNESCO World Heritage Site Status for its impressive ancient architecture, which is still very well preserved. Popular courses in France include Space & Aviation, Teaching, Law, Science & Medicine. If you are looking to improve your foreign language skills and enjoy continental breakfasts of freshly-made pastries then studying abroad in France might just be the best thing for you. For starters, whether you are a domestic student, EU or international student, there are no tuition fees to study at undergraduate level! There is, however, an administration fee to be paid per semester, but even with this, it brings the total tuition/admin cost of studying a year in Germany in at under $1,000. English is generally taught as the second language in Germany from a young age, which means you won’t need to worry if your German is not up to scratch. The cost of living in Germany is about average for Europe, with Study-in.de recommending that you allow at least 800 euros ($850) per month for living expenses. The biggest outgoing from this will be rent – on-campus accommodation in halls may prove to be the cheapest option, although you may prefer to live in a city for its nightlife. Germany has a comprehensive public transport network, giving students many ways to travel cheaply, which may help you live a little further away from the city centre to save money on rent. Finally, students from the US do not need to apply for a VISA to study in Germany – you just need to register at the local Residents’ Registration Office and the Aliens’ Registration Office to get a residence permit for your time in the country. For a simple and cost-effective study abroad experience, Germany is a great location for international students. Ireland is a beautiful green country where the sun may not always shine, but the people still do. There are 7 universities, 14 Institutes of Technology and 7 Colleges of Education. There are also a number of third level institutions which provide specialist education in areas such as business, law, arts & design and music. The oldest institution in Ireland is Trinity College Dublin which was founded in 1592 – that’s almost 180 years before the United States of America was founded. Wherever you go in Ireland you will find old buildings still standing – Dublin Castle, King John’s Castle and Trim Castle were all built in the 13th century. Read more about the historic buildings of Ireland. All 7 of the Republic of Ireland’s universities are found in the top 700 QS World University Rankings (2015-16), with the top two being Trinity College Dublin (TCD) in 78th position and University College Dublin (UCD) in 154th place. Which returns flights available between a number of Irish airports and the United Kingdom from as little as £14 ($17.50), it’s no wonder that the UK is the top destination for Irish students to study abroad. You can fly return from Dublin to Newcastle, Birmingham, London, Nottingham, Bristol, Edinburgh, Leeds, Glasgow, Liverpool or Manchester all from under £20 ($25). The UK is also the top provider of international students in Ireland, although the USA was at the number 4 spot in 2014, providing just over half the number of UK students studying abroad in Ireland (circa 1,100 students). With a very European culture and a notably young population, particularly in the main student cities such as Dublin and Carlow, Ireland is seen by many as a cool place to study – and with European students getting free tuition in Ireland, it’s not surprising that there are a wide range of European student nationalities in Ireland. So if you’re looking for a bit more laid back study abroad experience, the Emerald Isle may be the best study abroad choice for you.